When Chris Chataway died a couple of years ago, I wrote an obituary recalling the various lives of a multi-talented man, mentioning in passing that he had been a long-serving member of the west of London running club, Walton AC whose ranks had briefly been swelled in the late 1940s by an even more illustrious member – Alan Turing. While Chataway had been a world record holder, a Commonwealth champion and one of the first sub-four milers, Turing had once finished fifth in the AAA Marathon. Of course, Turing was immensely better known as the genius whose research led to the invention of the computer and the broader field of Artificial Intelligence. And though computers have long since relegated humans to also-rans in games like chess and Go, the ‘Turing Test’ – where a human ‘converses’ with a computer in another room, and cannot distinguish whether it is an AI or not – has yet to be passed. I also mentioned in the blog that Chataway and Turing had once competed together for Walton AC in the long since abandoned – due to traffic pollution – London to Brighton road relay. Out of the blue a couple of days after publishing the blog (link below), I received a response from Ed Whitlock, relaying the news that he too had been a member of the same Walton team in that London-Brighton. I penned a quick reply, outlining, for those who may not have known him, Ed’s extraordinary career as a latter day athlete; which is to say that he had been a terrific junior in the UK before giving up running to concentrate on his engineering career, emigrating to Canada, and resuming running in his early forties, going on to produce a series of vets’ or masters’ performances which defy belief. Another day or so after Ed’s contact, a punter wrote to marvel at this confluence of three such extraordinary characters in the same team and suggested that Walton should be renamed ‘Outliers AC’. I was reminded of all this a few days ago when Ed Whitlock pushed the envelope a step further. Aged 85, he ran his (almost) ‘local race,’ the Toronto Marathon last Sunday in 3hrs 56min 38sec. Now, if you think that is extraordinary, consider that, at the age of 80, Ed ran Toronto in 3.15.54. And it doesn’t end there, because it didn’t begin there. 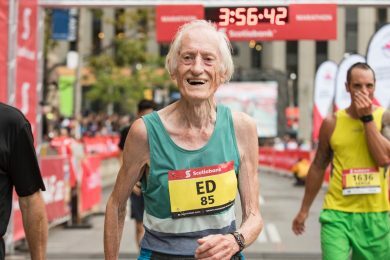 At the age of 73, Ed ran 2.54.59, again in Toronto; a year later he broke three hours again, and remains the only person in history to run sub-three over the age of 70. Some other of Ed’s times to contemplate for those of you who, like me struggle to break 25mins for 5k in my seventh decade, what about 18.33 and 38.04 for 5/10k at 74! In wondering just what Ed might have achieved had he continued running in his twenties, it may well be that he would have had enough of running by now. I’m reminded of that tenacious character Jim Alder who, among many other achievements won the Commonwealth marathon in 1966. Decades later, having run a typically gutsy, but losing vets’ race in his mid to late forties to someone who, unlike Jim had never done it in his twenties, Jim simply said, ‘I’m f—-d, Pat. All that training in my twenties has f—-d me. But at least I did when it counted’. This is not meant to demean Ed Whitlock’s achievements. Far from it. I’m full of admiration. I didn’t do it, either then or now. But Ed has; and long may he continue to do so.